When Peugeot's Jean Todt first recognised the increasing flexibility and freedom offered by FISA's vehicle regulations, and convinced his company that they should build, market and seek homologation for a car designed specifically to win rallies, he changed the face of modern rallying. He cannot be censured for this. It was simply he who was astute enough to spot the liberty first, grasp the opportunity and do for his company precisely what was expected of him. He did it outstandingly well, and when the small, light, powerful, rear-engined, four-wheel-drive 206 Turbo 16 began winning almost everything in sight, other manufacturers took fright and retreated immediately to their design screens. Audi had enjoyed considerable success with its Quattro, far removed from the previous winning 4WD vehicle — a factory Jeep!— but the new Peugeot was in a class of its own. If other teams wanted to have any chance at all, some subtle duplication was needed, and the odd improvement here and there. The result was the appearance of cars such as the Lancia Delta and the Austin Metro 6R4, whilst others, such as a new Ford, made progress through the pipeline. Our opinion is that the new flexibility of FISA's vehicle regulations was no accident. Under Balestre, it was more likely part of an overall plan to create greater spectacle by encouraging supercars, to make routes shorter and more compact, and to have the action predominantly in daylight in order to facilitate spectating and televising — all leading to clicking turnstiles and signatures on lucrative TV contracts. Alas, it all changed in Corsica in 1986 when Henri Toivonen and Sergio Cresto were tragically killed in a violent accident in their Lancia, prompting Balestre to announce, with precipitous haste, that the new generation of high-powered Group B cars would be banned from the World Rally Championship. He was as wrong to outlaw them so abrupdy as he was to create the opportunity for them in the first place. In their place came Group A cars, not all that far removed from those of Group B, but far enough to confound manufacturers and throw enormous spanners in the delicate works of their costly plans for the future; plans which had to be completely revised at the huge expense of dumping a vast accumulation of technological development which had become obsolete overnight. Peugeot took legal action against FISA for this, and withdrew from World Championship rallying. With as much alacrity as Balestre displayed when announcing the end of Group B, Lancia declared that it would continue in the series with a Group A version of the Delta, later developed into what was called the Delta Integrale. Immediately, the success which Peugeot had enjoyed was taken over by Lancia, and once again other teams were faced by costly redevelopment programmes. Meanwhile, Lancia's victories became almost monotonous. In 1987 the team romped home championship winner, and so often were two or three Deltas in the leading positions that the management was able to decide which of its drivers should win. The drivers' series that year was won for the second time in succession by Juha Kankkunen, recruited after Peugeot's withdrawal, but he became so disenchanted by team orders that he left after just one year to rejoin Toyota, the team which gave him his first chance as a professional. Even on his first outing for Lancia, at Monte Carlo, he was told to slow down to let team-mate Biasion win. What a welcome for a World Champion! In 1988 the same situation prevailed, but there were the first signs of a refreshing change. Toyota took its new 4WD car to its first outing in Corsica, although it stood little chance of winning on the island's tarmac roads. It appeared again in Greece, but it was not until the Thousand Lakes Rally (the name has been officially changed, though we can't think why, from The Rally of The Thousand Lakes) that the new Toyota really showed its mettle as a Lancia challenger. Juha Kankkunen's Toyota and Markku Alen's Lancia were so closely matched that we saw the first real display of exciting, exhilarating rallying for some years. The two were separated only by seconds, and Kankkunen was more often ahead of Alen than behind him. Sadly, an oil leak leading to engine failure put the Toyota out just a few stages from the end, and prevented a great duel reaching its conclusion. At that time, only Toyota had something to pit against Lancia. Although Ford's rearwheel-drive Sierra Cosworth could win (and did last May in Corsica) on tarmac, it was hardly an all-rounder, whilst Mazda showed some potential when its 4WD 323 won the 1987 Swedish Rally. Since then, the Brussels based Japanese team has been plagued by a variety of mechanical failures which have put the cars out of several rallies before they could really demonstrate their worth. This is not offered as an excuse, for reliability is as much part of a car's vital requirements as its performance. An engineering error is not as dramatically obvious as a driver's mistake, but it is just as valid after all, and the inference was that when Mazda managed to put its technicalities in order, it would have a car to be reckoned with. That inference was borne out when Mazda joined the line-up of talent for the final qualifier of the 1988 World Championship, the Lombard RAC Rally of Great Britain, and made an immediate impression. Fortunes changed rapidly, leaders came and went, and there was no clear indication of who would win until the very last special stage. 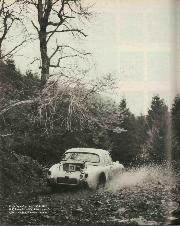 Although the only world title remaining in doubt was that of Group N Champion, the RAC attracted its customary spread of competitors, both professional and amateur, all eager to tackle the abominable conditions which a British November invariably provides. We often wonder why it is so popular to endure dank, dripping forests, murky moorlands, bleak, foggy hillsides, blisteringly cold mountains swept by biting winds, and tracks which can be covered by anything from rock to bog, or from fresh snow to sheet ice — and all without the benefit of either tyre studs or pace notes. Masochism doesn't come into it. It's simply a matter of challenge. The tougher it is, the more attraction it has. All the precision and sophistication in the world can be worth nothing when the weather confuses even the best-laid plans. At the other extreme, the sarne applies in Kenya, and it's high time that FISA, and all its corporals scattered throughout various national clubs, were made to acknowledge that one of the great and popular features of rallying is its unpredictability. It is almost a voyage into the unknown, defying any finite prognosis. Manoeuvring it insidiously towards the clinical precision of circuit racing is nefarious and immoral. It is seventeen years since the RAC Rally, after a decade at one of two hotels near Heathrow, took up the gypsy life and began moving around each year from city to city. In 1971 it went to Harrogate, and it snowed then just as it did when it went there again in 1988. On tarmac, the skills of various drivers in maintaining maximum speed whilst getting as close as possible to the limit of adhesion are very close indeed, and it's often difficult to perceive any difference. On dirt surfaces, the gaps between levels of skill are very slightly wider; on snow or even mud they are even wider, whereas on completely mixed surfaces of snow, slush, dirt and sheet ice they are at their widest and often plain for all to see. 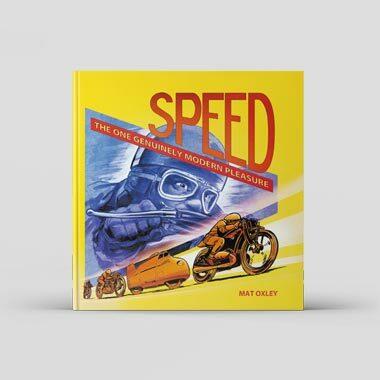 Progress, as fast as possible, must be maintained all the time, but progress along the road, not off it, and the ability to sense when that crucial adhesion limit drops dangerously low is a rare skill which sets a winning driver apart from his fellows. That skill was demonstrated time and time again during the RAC Rally, although even the most talented drivers found it difficult to keep up their pace and remain mistake free on atrocious surfaces which often varied from corner to comer. You could either drive at undiminished speed and risk being caught out by sudden ice, or you could slow down and keep something in reserve for the unexpected. In the latter case, the risk you took was that of someone else being faster than you simply because he kept less in reserve and was fortunate not to go off the road on sudden ice. 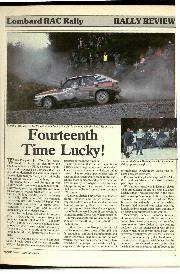 There can hardly have been anyone who was not caught out somewhere or other during the five days of the RAC Rally. Even the winner himself owes much to the spectators who pushed his car back to the road after he spun and went off backwards down a steep bank up which it would have been impossible to drive. That he was able to regain his five lost minutes and recover his lead, making no more mistakes whilst others slid off and either lost time or went out of the rally altogether, is to his immense credit. Markku Alen and Ilkka Kivimaki have been trying for fourteen years to win the RAC Rally, and their victory this year was one they richly deserved. It was quite an amazing performance, especially as Lancia had not just one team providing dangerous opponents, but two. 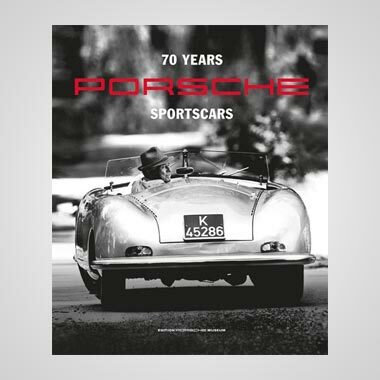 Indeed, it was the first time for several years that we have seen a well-matched contest between cars of more than two makes. Driving two works Lancias were Alen and Mikael Ericsson, while Pentti Airikkala drove one privately and Jorge Recalde a Group N version. 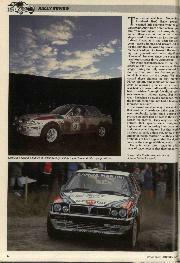 Mazda also had two cars, for Hannu Mikkola and Timo Salonen. Mikael Sundstrom drove another, and Pascal Gaban a Group N car. 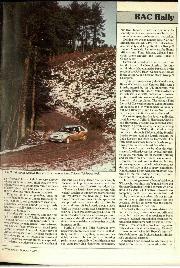 Gaban and Recalde were two drivers in line for the Group N Championship, the only world tide which remained to be settled by the result of the RAC Rally. Gaban beat Recalde in the category, and became World Group N Champion. Toyota had three cars for Juha Kankkunen, Bjorn Waldegard and Kenneth Eriksson; a fourth, entered by the UK importers, was driven by Jimmy McRae. Ari Vatanen drove a Mitsubishi Galant VR4, but endured constant problems with his power-steering and never figured in the top places. 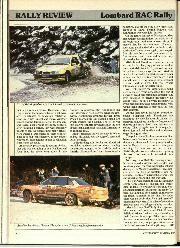 The various Ford Sierra RS Cosworths entered were outclassed on the snow and ice by four-wheel-drive cars, but Stig Blomqvist and Carlos Sainz drove extremely well to finish sixth and seventh. The route, spanning five days, was divided by night stops at Telford, Harrogate, Carlisle and Harrogate. The first day consisted solely of stages in private estates, the second a loop through North Wales, the third a loop northwards through Kielder and the Scottish Border forests, and the fourth through the Lake District and back to Harrogate. The fifth went eastwards towards Scarborough, through the forests of North Yorkshire. The leader's total penalty after the eight stages of the first day was just over 27minutes, so the day was really just for spectator-pulling and its effect on final results was minimal. However, the old maxim that on Mickey Mouse stages you can gain little but lose a great deal proved true in the slippery conditions. 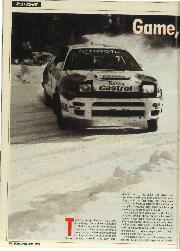 Kankkunen led from Alen after that first day, while of the ten leading drivers, five were Finns and three were Swedes. The remaining two were Britain's Malcolm Wilson who was ninth in a Vauxhall Astra and German Champion Armin Schwartz who was sixth in his Audi 200 Quattro. Schwartz was competing for the first time at this level and displayed uncommon talent. He was fortunate to have a first-class mentor for the occasion, for his co-driver was the experienced and capable Arne Hertz. The works Mazdas both broke driveshafts on the first day, Salonen once and Mikkola twice, but reduction of turbocharger boost pressure lessened transmission strain for the remainder of the rally and there was no further trouble. Even after this problem, they were fifth and seventh after the first day. 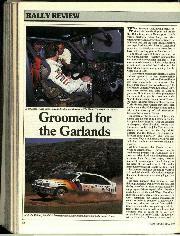 Kenneth Eriksson retired when his Toyota's camshaft drive belt broke, and McRae when his similar car's crankshaft snapped. Although it had snowed heavily during the night before the start, the weather after the first day was much clearer. However, it was very cold and the snow and frozen slush were often punctuated by dangerous patches of sheet ice which caught out many. Another hazard was the dazzling effect of the low sun, and several people went off simply because, after rounding a corner, they were suddenly unable to see. We wonder how many drivers were wearing large peaks on their helmets. This does help considerably, as any aviator will vouch, although not in case of reflection from ice on the road. As the rally progressed it became obvious that this was not going to be a Kankkunen/Alen duel, for there were others in the running. A puncture cost Kankkunen his lead, after which Alen slowly opened the gap. 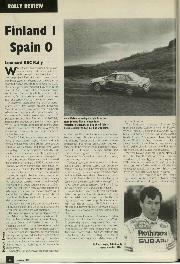 Later, Kankkunen dropped further down when a gearbox oil leak caused a small fire which cracked the housing. The effect was loss of drive to the front wheels and at the end of the second leg he was sixth, and fortunate to be running at all. Mikael Ericsson slid on sheet ice in Wales and put his Lancia over the edge of a bank and out of the rally. In the third leg, Alen lost his lead after third gear failed, and mechanics set about changing the gearbox, at night, at the roadside, and in bitterly cold conditions. Later, he collected a puncture, slid off the road a few times and dropped to third, behind Mikkola and Kankkunen who were joint leaders. On the return journey to Harrogate, Alen set about recovering his loss, but when he slid off backwards, and over a steep drop, it seemed that his rally was over. However, spectators manhandled the car back to the road and off the car went again, undamaged. But this time the gap had been increased by five minutes, and there didn't seem any chance that he could make that up. 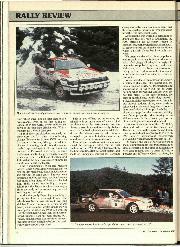 Mikkola and Kankkunen continued to do stirring battle, changing places occasionally, but a tactical decision by Toyota to delay their entry into a snowy stage paid off. Mikkola delayed his arrival at the start control as much as he could, but eventually had to go in and found himself driving in fresh snow, with not a wheel mark in sight. The two Toyotas followed and made far better times. 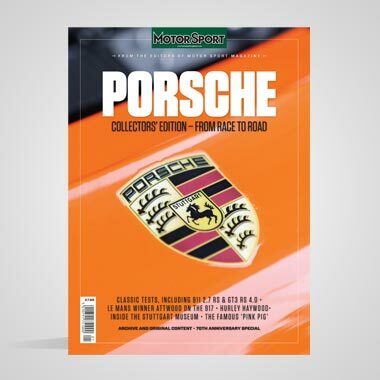 We recall exactly the same tactics being used seventeen years ago, when the war of nerves to avoid being first into a special stage even extended to driving deliberately up wrong roads, or into private forecourts to avoid being seen by those coming behind, who would then be tempted to carry on to the stage start controls. On the final day in Yorkshire, everything began to happen again. Kankkunen was caught out by sheet ice towards the end of a stage which had been mostly ice-free, went off the road and broke his oil cooler against a tree stump. They struggled out of the stage, but the oil loss had had its effect and on the next stage the engine seized. The point where Kankkunen went off had been a really bad one, and there is no doubt that many others would have gone off too had not the Toyota driver put out a red triangle as warning. He was just too late to warn Airikkala, who lost several minutes regaining the road. Fortunately, he missed the tree stumps! Next to go was Mikkola. Cresting a brow, he encountered a low sun, was dazzled, and went straight off the road. Although not badly damaged, the Mazda was well and truly stuck, and even the help of spectators was not enough. Eventually, during the attempt, the car's gearbox broke and that was that. This put Alen back in the lead, reasonably comfortably ahead of Salonen and Waldegard , and this is how it stayed to the end. What an amazing string of changes at the head of the field! Nothing had been certain all the way to the finish, although in the final few stages there was no doubt that Alen had lifted off, preferring to give small bunches of seconds to his rivals than risk being caught by more ice. Alen's first ever RAC Rally victory pleased him no end, and both he and Kivimaki were delighted to have finally accomplished this, at their fourteenth attempt! What made them feel even more satisfied was the fact that it had been against really tough opposition, and in the face of many troubles along the way . GP.